The week of June's third birthday, I decided it was finally time to ditch the diap. I had waited and waited because I didn't think she was ready... she didn't care if her diaper was dirty and kind of hated sitting on the potty. And honestly, I wasn't ready. Diapers are easy and I wasn't ready to stop being lazy. Ha! It seemed like those things weren't going to change so it was the best possible time to start. 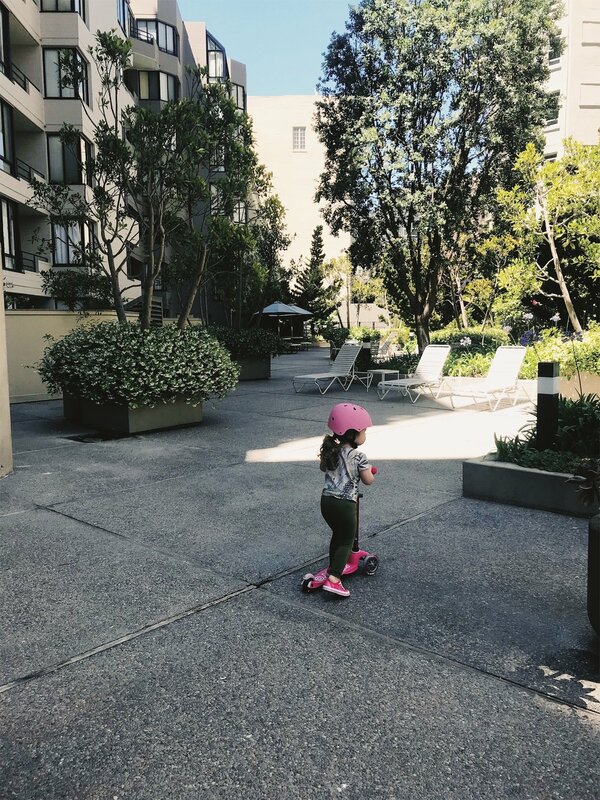 Work was slow for me, we didn’t have any big plans coming up, no one was visiting for the first time since we moved to SF, since she just turned three so there was some “you’re so big! !” excitement, and her lil' bestie had just started potty training so both tots and mamas could have a friend to go through it with. Literally the night before we started potty training, I pulled up a blog that I referenced a lot when June was a newborn/infant and I needed a resource for figuring out a good routine for each stage. I read every one of her posts on potty training (here's the main post) and decided to try the method she talked through and just do more research if for some reason that didn't work for us. Basically – I did minimal research, I'm totally winging it and documenting it here. This is definitely not a pro how-to guide. It's simply a log of what we tried and how it went.. and some of my thoughts along the way. I know people always say "just do what works for you" and I agree, but I've always found it so helpful to hear about other people's experiences so I can get ideas and start to get an idea of what might actually work for us. That's my goal with this post! Undies – Our faves so far from Old Navy... we have literally a week's experience so if anyone has recs please let me know. Potty – We had an older version of this one from our baby registry (Thanks Aunt Kathy!) but we also have this one that I think she'll like when we start going on the actual potty. I bought it looking for a softer option because she always said the potty hurt. She always has a ring on her booty regardless. Towels – To sit on on the couch and watch TV 24/7 for a couple days. Ha! Rewards – We did jellybeans because they are June's fave, but you could do a different candy or stickers or whatever feels like a treat... just pick something that you're cool with them having a lot of! Drinks + snacks – So they have to go. Timer – I started with a kitchen timer so June would hear it go off but I ended up just using the timer on my watch because she didn't care and it was easier. 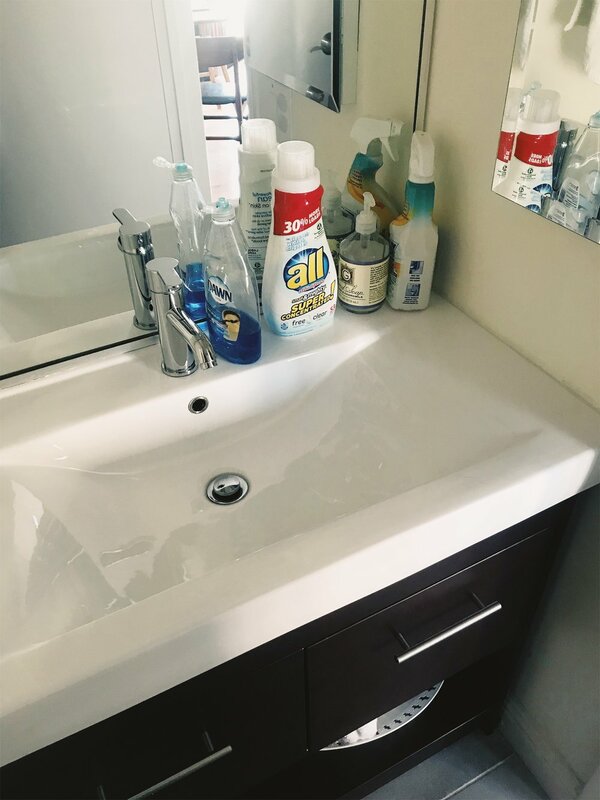 Cleaning supplies – texted Chris and asked him to pick up more Lysol wipes and paper towels half way through the first day. So. Entertainment – We watched a lot of TV... and still are, honestly. There was also a lot of Insta-scrolling, living roof scooting, pulling out alllll the toys, reading books, etc. Got all of the supplies together (see list above) and sat June down to tell her the plan and get her excited about it. Oh, and I rolled up the rug in the living room for the foreseeable future. Every 15 minutes (unless she needed to pee earlier or had an accident) she sat in the potty for 5 minutes. She got a jelly bean when the timer went off and her undies were dry and we celebrated big (two jelly beans/candy/lots of high fives and hugs and squealing) when she actually went potty! The first hour and a half were rough. I was majorly doubting that it was the right time even though she was three and I was feeling like it was already pretty late. Maybe she needed more time!? She peed and pooped in five of our six pairs of undies. She didn’t pee in the potty once and within a few minutes of standing up to play again she’d pee! When she had an accident she just kind of looked down like “uh... what’s happening?” until about the fourth or fifth accident... she said “oh no!” and ran to the potty. This time she actually peed in the potty! PARTY!! This was the first time in her life. After that she went commando for about an hour and a half (because we were almost out of undies and I didn't want to risk her peeing in the elevator or our building's shared laundry room... but I think it actually helped the process) and didn’t have any accidents but didn’t pee in the potty either. In the last two-ish hours before nap she peed two more times in the potty and had one smaller accident. We put a diaper back on for nap and she slept longer than she has in months. When she woke up she was not pumped to put undies back on and cried wanting a diaper. She’s usually pretty grumpy when she wakes up but I was definitely worried that this could be a problem. When I sat her on the potty she said her potty hurt and sobbed until I held her and calmed her down. She just sat on a towel on the couch, watched a show and had a snack. About 10 minutes later I told her it was time to check, sat her on the potty and gave her a jellybean for staying dry and she was excited again! She only had one accident that night and it was smaller; peed one and right before bedtime POOPED!! I was totally shocked and so proud. Also cleaning poop out of a tiny bucket is super weird. When June woke up she stayed in bed in a diaper and watched some tv on the iPad. When I got out of the shower we changed June’s clothes and put some undies on. The first time we checked she had some poop in her undies like she started to poop but held it in. (Wow. Having kids really makes nothing off limits.) She didn’t poop in the usual 5 minute sit and wanted to keep trying. She ended up sitting there for like 30 minutes, getting up to play then saying she had to potty (first time she did that!) and sat there for another 30 without pooping. We went back to our 15/5 sched. and she peed twice back to back! Then June’s bestie and her mama stopped by to hang out and bring June a birthday present... she played without having any accidents (except some slightly wet undies) and peed in the potty! While she was eating lunch we stretched our usual timeline and she had the tiniest bit of poop on her undies. She sat on the pot and pooped for the next 20ish minutes. Grosssssss but yaaaay! We started stretching our time between sitting on the potty in the morning, then went to the pool for our first mini outing without a diaper. She did great! She only had one little accident later that day, peed 5-6 times, but didn’t poop at all. Chris went to church and June and I stayed home to keep practicing… not ready yet! (Speaking for myself… she’ll probably be ready before me.) Before he headed out, she ran over to the potty, pulled down her undies and peed completely by herself!! Chris and I had an ‘OMG it’s working’ look.. ha! While he was gone she had one accident that confirmed staying home was the right call. After that she did great all day! We stretched out our time to 30ish minutes and she peed and pooped a couple times. (back to the usual… how does this kid poop so much!?) She told me she needed to go a couple times and even broke out in a Daniel Tiger song once. Haha! June and I usually run errands on Monday mornings so I did them during her nap on Sunday when Chris could be home with her! We put on pants! And left the house! …Just to go downstairs and do laundry and play in the courtyard but we did it! We didn’t do the usual timer routine, I just asked her if she needed to potty every now and then/if she looked a little squirmy, and she told me she needed to go a couple times. No accidents at all!! Except for the poor tiny toy that feel in while she was going potty… he didn’t survive. Got too confident too fast and didn’t ask her/make her sit on the potty quickly after putting undies on and had out biggest accident yet. Oops! After that she did great again. We walked an ENTIRE BLOCK to get take out for dinner with any accidents. Started the day with a little poop accident; then left the house quickly for a last minute doctor appointment for me so we were gone for a while with no accidents; then had our first couch accident. (got brave and took off the towel too soon) She did great the rest of the day. On the week-versary of potty training she had her first public bathroom experience. We went on a long-ish walk to run a few errands and we happened to be right by the bathroom in Trader Joe’s when she broke out in Daniel Tiger's song… “if you have to go potty STOP and go right away! !” She’s always been uncomfortable with the big potty so I was worried about this part but she did great and actually peed! No accidents for the rest of the day and she got even better at doing (almost) everything herself. Potty training real-ness. TP became one of the toys. The accidents are how they learn. I think I was waiting for her to be able to hold it before we potty trained. Now I realize that’s ridiculous… that is the ‘training’ part. It was amazing to see the progress from the first few accidents where I was worried it was too early and she didn’t get it, to her learning on her own how to hold it and get to the potty. I didn’t realize we were doing this well because I was totally just trying a random method I found on the internet… but I’m glad we did rewards for dry undies and going on the potty instead of sitting on the potty/trying to go. She has totally used the “I have to go potty” excuse to get out of bed (even though she’s in a diaper at bedtime… we don’t want to tell her to just go in her diaper and she prooobably knows that.) and to watch TV but so far it hasn’t been tooooo much. How the heck we're going to get 100% back into "normal" life by leaving the house all the time... and eventually sleep in undies too!? 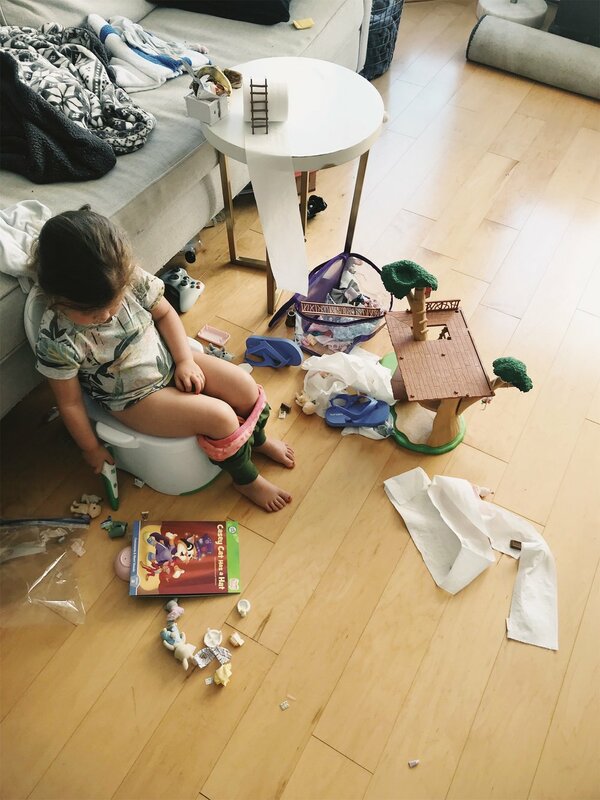 I guess we just do it and learn as we go – like the rest of potty training. Okay! If you have questions... well, I probably can't answer them because I'm totally winging this, but ask anyway and we can figure it out together. If you have suggestions please share with the class! !